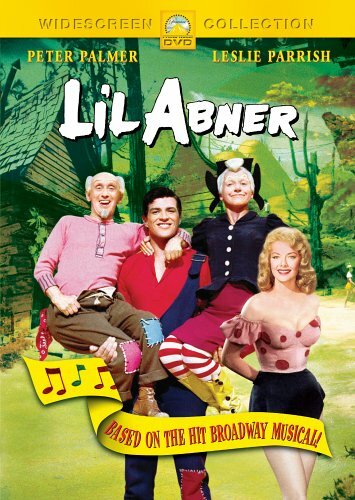 LI’L ABNER, the beloved cartoon strip from Al Capp, takes place in the hillbilly town of Dogpatch, which is deemed the most useless community in America. When the city is chosen as a test site for A-bombs, its colorful citizens take up the good fight, with lots of fun and merriment. Many of the actors and dancers from the 1956 Broadway version were cast in this film. Jerry Lewis‘s cameo was shot with the provision that Paramount would not use his name when marketing the film. This provision was followed but his likeness was used in one of the most prominent marketing stills for the film. Mammy Yoakum: I has spoken. Daisy Mae: Why it’s the Bar Harbor Scraggs. Romeo Scragg: Yeah, they’ve been barred from every harbor in the country. Mayor Daniel D. Dogmeat: Romeo Scragg, do you claim to be Daisy Mae’s kissin’ kin? Romeo Scragg: Yes, and that’s the whole trouble. Mayor Daniel D. Dogmeat: Trouble? Romeo Scragg: Yeah, I’d like to kiss her, but I don’t think I kin! Gen. Bullmoose: [talking about Appassionata von Climax] She works for me. She gets a salary, She sorts of lives with me. Li’l Abner Yokum: [to Appassionata von Climax] Really? Does that mean you gets bed and board, ma’m? Sen. Jack S. Phogbound: I’ll bet you were wondering what I’ve been doing up there in Washington, D.C. these past eighteen years. Mammy Yoakum: We didn’t care, as long as you was there and we was here! Gen. Bullmoose: Appasionata, you should have been here an hour ago! Why are you so late? Appassionata Von Climax: I had to make up. Appassionata Von Climax: No, with the chauffeur —  we had a fight! Gen. Bullmoose: [to his cronies] Remind me to fire that chauffeur! Mammy Yoakum: [talking about going to the city] You gals are going to have to go through a before-marriage custom called *engagement*. Moonbeam McSwine: Engagement, what’s that? Moonbeam McSwine: How long this engagement thing last? Mammy Yoakum: Sometimes a whole month. Moonbeam McSwine: A whole month? What are they, insecure? Available Jones: [being introduced to Gen. Bullmoose] Well, howdy General! Welcome to Dogpatch. I’d say “what’s your pleasure?”, but I see you done brought it with you. Daisy Mae: [about growing old and unmarried] I looked in the mirror this morning and most of my good years are gone. Marryin’ Sam: I guess you’re right. After all, you is pushing eighteen. Mammy Yoakum: Is you inferring you has money? Earthquake McGoon: Lady, I is filthy with it. Mammy Yoakum: Mister, you is filthy without it.